My favorite genres to read tend to lean toward Women's, Literary and Historical Fiction - with the majority of my time spend nose deep in a historical fiction novel. Both World War I and II are standard reading fare for me - I'm not sure what it is about that time period, but I cannot get enough. 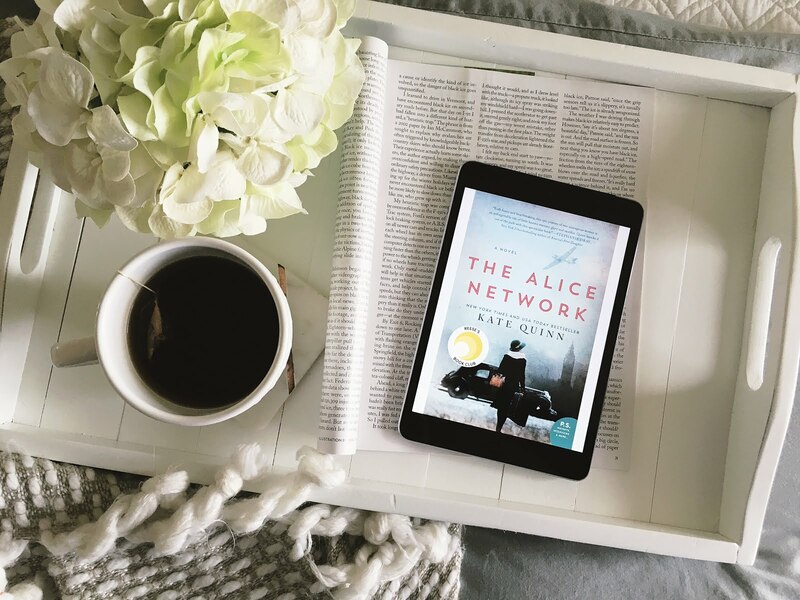 So of course, The Alice Network by Kate Quinn was perfect for me. I loved this book so much. It was a Reese Witherspoon Book Club pick last year and I would highly recommend this to anyone who loved The Nightingale by Kristin Hannah or has enjoyed Beatriz Williams' work (one of my all time favorite authors). The Alice Network is everything I want in a historical fiction novel. It's told in alternating voices from two very different women. Eve Gardiner in 1915 and Charlie St. Clair in 1947. Eve's chapters chronicle her time spent in the infamous "Alice Network" - based on an actual network of female spies in WWI. Her chapters were crackling, tense and full of anticipation for the next page. I couldn't tear myself away from them. Fast forward 30 years to socialite, Charlie St. Clair, who is unmarried and pregnant. Accompanied by her mother, she's en route to Switzerland with the plan of taking care of "the little problem." Little does her mother know, but Charlie has other plans and embarks on a journey to find her cousin Rose who was living in France during WWII. She's convinced that Rose must be alive and is determined to find her. When a common name and place draws Eve and Charlie together - they take off to France (along with Eve's driver, a wily Scotsman with his own secrets) to find out what happened to Rose. This book is a triumph, it's fast paced, emotional and wonderfully written. I loved Eve and Charlie's stories so much. Both women show courage despite heartbreak and I couldn't get enough of their moxie. For those of you who like a little romance thrown in - that's there too and I couldn't get enough of it. This book is plotted beautifully - I highly recommend. GAH. Elin Hilderbrand is the Queen and can do no wrong. If that's not a ringing endorsement, then I don't know what is. Elin Hilderbrand is always an author whose new books are ones I highly anticipate. She's probably one of the only authors whose expansive collection of work I own in its entirety. Yeah - all 21 novels. And of those, this one ranks right up at the top of my favorites. The Perfect Couple is exactly the kind of summer novel I want to read. I was completely absorbed with the characters and plot pretty much immediately. It jumps right in to the action - a murder mystery in which the maid of honor at a Nantucket wedding is found dead in the water the morning of the wedding. With the maid of honor dead, it's left to Nantucket's Chief Ed Kapenish to find out what actually happened. Basically this is a summer beach version of Clue and I am so here for it. The Queen of the Summer Beach Read out did herself with this one. As usual, there's an incredible ensemble cast that keeps the reader engaged and questioning every one's motives. With interwoven storylines and betrayals - Hilderbrand does an outstanding job keeping everyone on their toes. There were so many times in this book that I thought I had it figured out but kept changing my mind. In the end, I had a pretty decent idea of what actually happened - but was never sure until the last page. I loved catching up with some of my favorite characters from past novels - Roger Pelton (Beautiful Day) is one of my favorite Hilderbrand characters and I think every bride deserves to have someone like Roger at her side for the big day. The new characters were fabulous - Featherleigh cracked me up (especially while she was hitting on Nick (The Greek) during her questioning). The bride's mother Karen, who is battling breast cancer, was also one of my favorite characters. Her wisdom and courage were some of the best parts of the book, I LITERALLY CRIED. With memorable characters from Hilderbrand's backlist (Nantucket Nights, Beautiful Day, The Castaways, and A Summer Affair) and of course the charming Nantucket backdrop that we expect and love about Elin's books, this is exactly the kind of book you want to bring with you to the pool or anywhere. If you loved her earlier work you'll enjoy this - and if you're new to her work I think you'll enjoy this. Definitely one of my favorites so far this year. 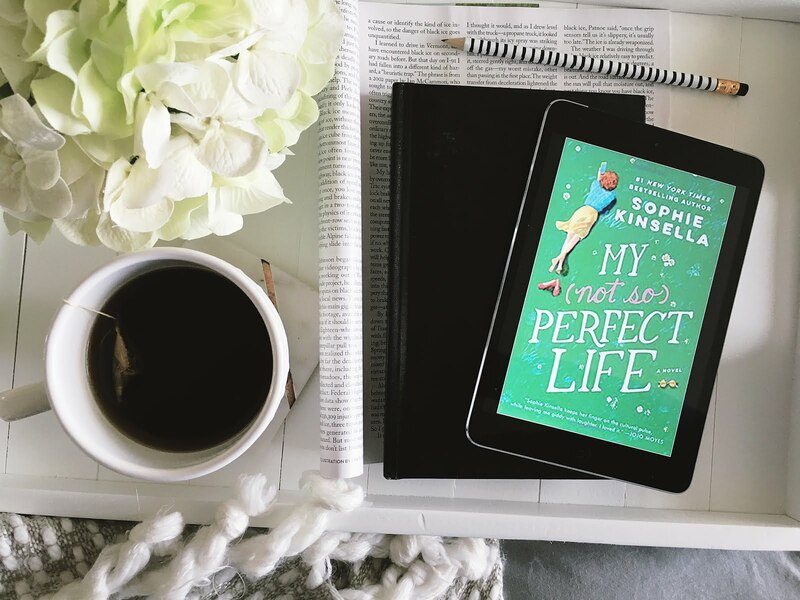 Sophie Kinsella's name is synonymous with adorable chick lit. Most people are familiar with her extremely popular Shopaholic series, which are mindless, yet fun books that for me are the perfect escape. They're easily digestible and entertaining. 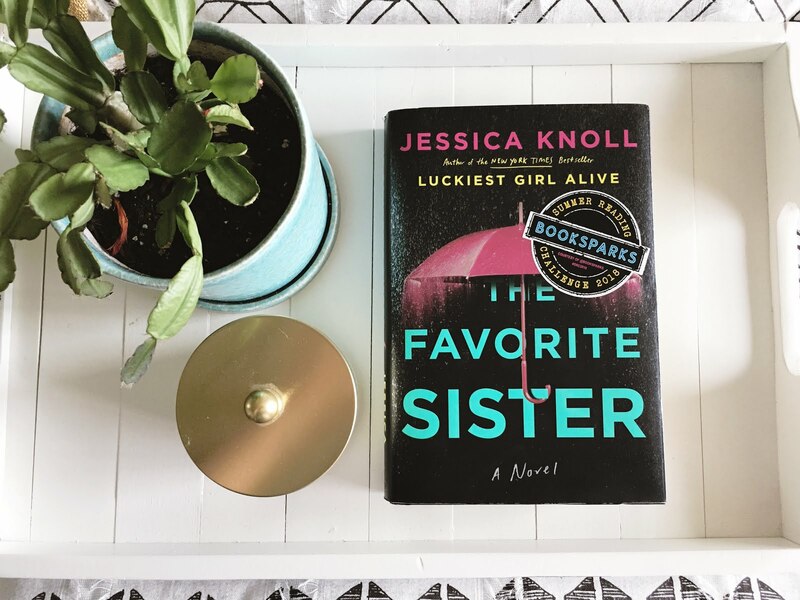 So as expected, My Not So Perfect Life checks all the boxes of a fun Kinsella novel that offers a perfectly light reading experience. If Instagram is any indication of one's success and posh experiences, Katie's living the life of a successful London millennial with the perfect marketing job, amazing friends and fine dining. But in reality, she's living in a closet, her flat mates are definitely not her best friends, she can't afford that hot chocolate she posted on her social media and her job is definitely far from dream worthy. In fact, her boss, Demeter, is an absolute nightmare. But moving from the country into the city is what Katie's always dreamed of and she's determined to make her life look perfect even if it's a far cry from it. But things don't always go as planned, and when Katie is let go from her job she trudges back to her home town to help start a "glamping" business at her family's farm. This book is darling and quite entertaining. I did enjoy the commentary on social media - which I think is a big part of the narrative. Katie does everything she can to appear happy and successful when she really isn't, and it's interesting how we manipulate our lives to appear a certain way on social media. This is a super fun book that had some vibes reminiscent of The Devil Wears Prada, and I think that for what it is - it's well done. Light and fluffy - predictable but fun. Look - if you're wanting to read something that's quick and entertaining, I would pick this book up. It doesn't offer anything to really sink your teeth into, but it's a fun read that will keep you entertained for an afternoon. Adept readers will see the major plot points coming, and Katie can get in her own way quite a bit. Even still, I enjoyed it. This is exactly the kind of book I want on my summer reading list. 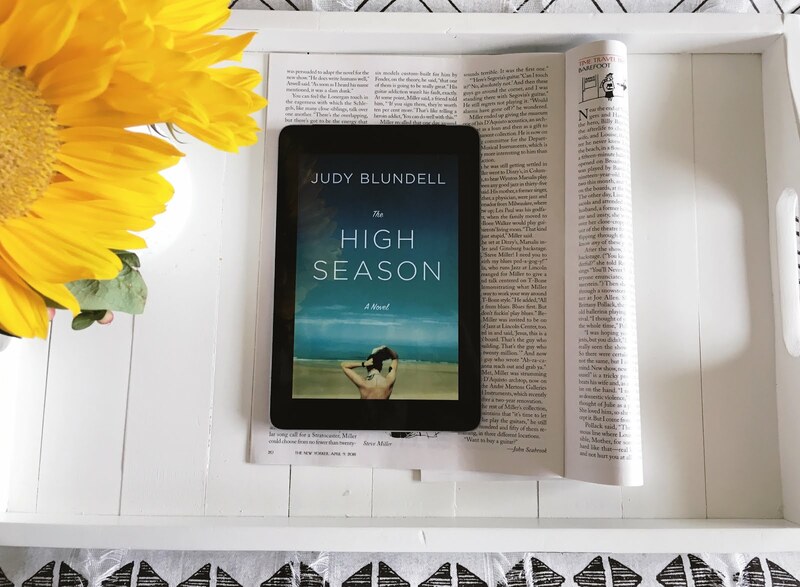 I love a nuanced domestic drama that keeps me flipping pages and that's exactly what I got with The High Season by Judy Blundell. The novel is the quintessential beach read, from the setting right down to the ocean blue cover art. This story takes place in Orient - a cozy and less popular spot than the sparkling, prestigious Hamptons - where Ruthie lives with her daughter and runs the local museum. It's here that she owns a beautiful beach house, but every summer has to give it up to be able to afford it. When her tenant for the summer turns out to be a New York socialite with ties to Ruthie's past in the art world, the summer becomes less predictable, setting off a chain of events that will change North Fork. I loved this book so much. To be honest, I find that I enjoy a domestic drama with characters who are flawed, their motivations questionable at best. These are the characters who come to life on the page for me, and this book was full of them. There were the obvious villains - I mean who could stand the petulant child that is Adeline's step-son (I'll be honest, I wanted a different outcome for him). But my favorite was Doe, who had questionable morals and who's actions sometimes blurred between right and wrong - but wasn't afraid to go after what she needed. These are the types of characters I find interesting, their stories and motivations compelling. 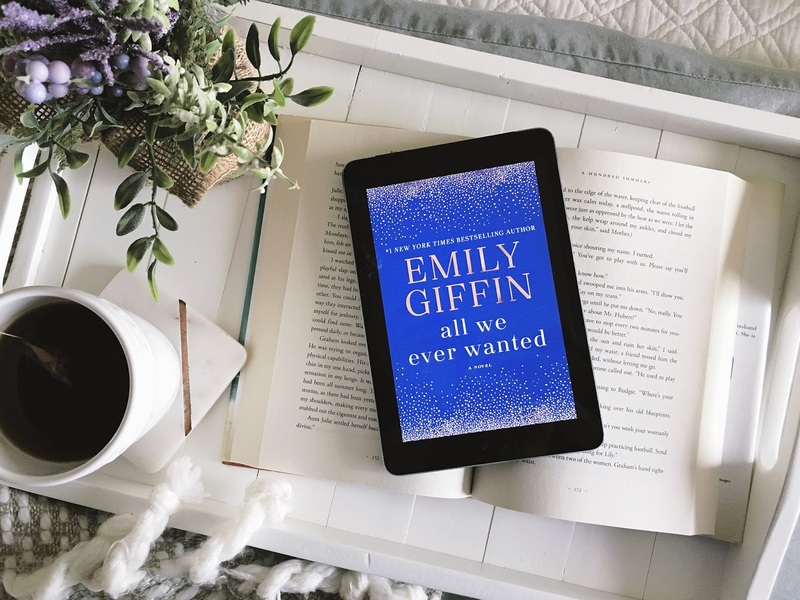 This isn't a huge plot book - instead it's a character driven narrative about betrayal, love and finding your way when things don't go the way you expected them. This book is exactly what you'll want to be taking with you on vacation or settling in with a crisp glass of wine for an evening escape. An advanced Egalley of this book was provided by the publisher and netgalley for an honest review. All opinions are my own. Okay, there are a lot of things I liked about Love and Other Words and then there are some things I have questions about. This is a really sweet, romantic book with a lot of elements that I think readers in the romance/lighter fare women's fic genre will enjoy - but I do think that readers who are looking for a little more depth will see this as some sort of lightweight Nicholas Sparks novel - elements of The Best of Me come to mind. I won't go too much into synopsis here - if you're reading this review you likely already know the premise of this book. You know that Macy and Elliot spent their adolescence together, they were best friends who became more than friends and then something happened that caused Macy to completely drop Elliot from her life. Eleven years after the thing they run into each other and it completely disrupts their lives. -Elliot obviously. What's not to like about the super sweet book boy who's always pushing his glasses up the bridge of his nose or how he listens so intently to Macy and gives actual quality feedback. He's basically a unicorn and he's the sweetest. -All the chapters that take place in the past. I really enjoyed Elliot and Macy's friendship, how comfortable they were with each other. I think that many aspects of their relationship will be relatable for people and this relationship is believable. -Pacing and writing style. This book is about 400 pages and is a very quick read. I read the majority of it in a day. And that wasn't me sitting around all day long doing nothing. The writing is good, very accessible and didn't feel the need to roll my eyes. -Macy in the present. Okay, this might be an unpopular opinion - but come on girl, you can't go from zero to sixty in the matter of a week. Part of my issue with this is that we know that something really bad happened in the past, but we don't find out what it is until almost the last chapter of the book. So I get that it's been eleven years and she was heart broken all that time and couldn't get over the thing, but I feel like we should have had more internal conflict here or something because even though we get the back story in the end it felt really clichéd. -Convenience. So let me explain. I felt that the supporting characters were a little flat and conveniently moved the story in one direction. Especially Sean. There's supposed to be conflict throughout this book, but everything happens so conveniently for the characters. I wanted there to be a little more conflict and emotional toil. -THE THING Okay, it's not necessarily the thing itself (that was bad though) - it's that we don't know what exactly happened until the end of the book! And then I'm supposed to believe that after the air is cleared everything is just okay? Just like that? IDK. I have a hard time believing that after eleven years of holding onto the hurt and heartbreak she would just let it go so easily. But that's just me. Also this is the MAJOR CONFLICT of the book and it seemed resolved very easily with little processing on either party's behalf. In my opinion this would have been stronger if we would have been able to watch the characters work through this. So, overall this isn't a perfect book in any way, but I did enjoy reading it. I think that there is a certain group of readers who will really love this - it'll be right in their wheelhouse and that is amazing. 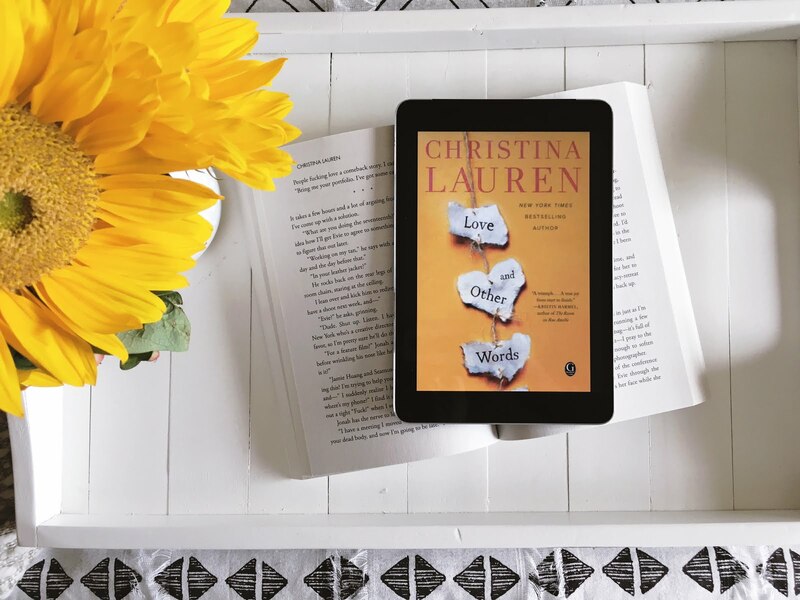 I enjoyed the book and would definitely pick up another Christina Lauren novel - but I can't overlook the areas that suffered in this one. If you're looking for something with a little more depth and emotional pull to it, I would probably pass on this. But if you're looking for something that is sweet and quick - check this out. Beatriz Williams is one of my favorite authors. She's my favorite author writing historical fiction today, and what I think I love most about her books is how they remind me of classic films. Her ability to write witty, fabulous dialogue (banter) just makes me smile every time I pick up one of her books. She writes incredible characters, perfectly interwoven storylines - plus her books are like the marvel universe of historical fiction books - characters from old books are always popping up here and there. It's so much fun. If I could choose an author whose work I wish I could have written as my own - Beatriz Williams is that author. If you haven't ever read one of her books I highly recommend her very popular Schuyler sisters trilogy, start with The Secret Life of Violet Grant, then Tiny Little Thing (my favorite of the three) and finally Along the Infinite Sea. Or A Hundred Summers. They're all amazing. 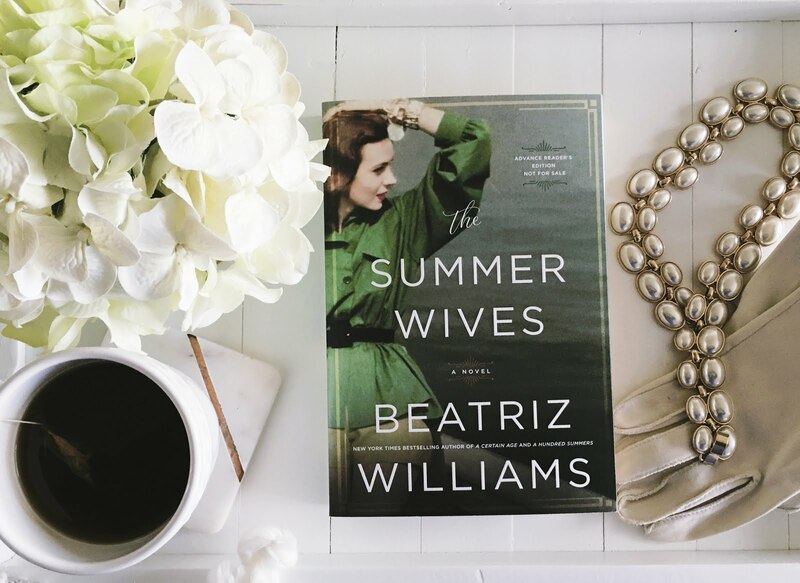 So you can imagine my absolute delight when I received a copy of her latest, The Summer Wives, from William Morrow publishing - I literally screamed in surprise and happiness when I opened the package. I know - I'm not dramatic at all. This book is the book that I notated, dog eared and flagged all through my reading of it. I took this book with me everywhere and I could not put it down. This book is my summer book of 2018. Please believe me when I say, this is probably one of my absolute favorite of Beatriz Williams' books to date. This storyline is everything. In 1951 Miranda Schuyler arrives on Winthrop Island with her mother - who is soon to be wed to Hugh Fisher, a notoriously wealthy man whose summer home on the Island is as exclusive as it is expansive. The union between her mother and Mr. Fisher introduces Miranda to the dazzling Island elite and their impressive world of ivy league schools, cocktail parties and families. But beyond the stayed traditions of Winthrop's summer residents there is another population of people who inhabit the island year round - a group of Portuguese residents who make their living lobstering in the harbor and operating businesses that cater to the wealthy summer patrons. Among them is Joseph Vargas, a young lobsterman who is friends with Miranda's new step-sister Isobel. Miranda finds herself drawn to Joseph's easy manner and charisma - but when a tragic event occurs one summer evening, Miranda finds herself banished from Winthrop Island and Joseph is arrested for murder. But in the summer of 1969, Miranda returns to the island where the affluent Fisher family home is now a crumbling artists retreat, her mother and step-sister barely reminiscent of the glittering people they once were. Hiding from the world and her very public life as an actress, Miranda seeks refuge and love with those who once were her family and friends. Perfectly paced and plotted, this book is one of my favorites this year. Williams' draws her reader in with her trademark wit and observation of a secretive elite society. It's a novel of love, betrayal and loss that is truly transporting. An advanced review copy was provided by the publisher for an honest review. All opinions are my own. ALL THE STARS for How to Walk Away by Katherine Center. Just please, please trust me and read this book. It's not very often that I find something so compelling that I can't put it down. I'm a fast reader, but this book took less than a day to read and I enjoyed it so much. I think that there will be a lot of people comparing this to Me Before You - and I can see some similarities, but this book is just so much more hopeful than MBY is, it's about recovering and getting up out of the ashes when life literally shatters your plans. It's about finding that there are all types of happy endings and how to move forward through hardship. It's about self love and acceptance, and finding value in yourself as a human being who is worthy of loving oneself and accepting the love of others. And this book doesn't do this by glossing over the emotional hardships and challenges that come with a life altering injury. I thought the author did a great job of addressing the emotional state of her main character and the way she worked through her recovery in a way that was accessible and easy to empathize with. It's an emotionally engrossing read that I think many will enjoy. Margaret's first person narrative reads like a conversation with a friend. It's warm and inviting, even though the hard parts. She's surrounded by a quirky sister, sometimes overbearing mother, and supportive father. These characters are flawed, but still relatable and I loved hanging out with them, and watching them work through their fears and conflicts together. Overall this is probably going to be one of my favorite books this year, it's the one I immediately told my bestie to grab a copy of and will be recommending to all my friends this summer. A free finished copy of this book was provided to me by Booksparks for their Summer Reading Challenge 2018. Those who know me - know that Suspense/Thrillers are not my typical reading fare. But I really enjoyed Aimee Molloy's The Perfect Mother . I read this for a book club and was blown away by the expert pacing and plotting of this domestic suspense novel. I also never saw the twist coming in the end - so points to Molloy for stumping me and keeping me on the hook all the way to the end. It reads similarly to Liane Moriarty's work ( Truly Madly Guilty and Big Little Lies) - so if you're a fan of hers, check this one out. In this quickly paced novel, a group of first time mothers work together to bring home an abducted baby. On a sweltering Fourth of July night, during a Mom's Night Out, a baby is stolen from his crib. His mother and her friends, members of a mommy group called the May Mothers (named for the month of their children's births) all blissfully unaware that anything has happened until the babysitter calls telling them that the baby is gone. Reeling from the shock that something this tragic has happened so close to home and to one of their own the women work to unravel the events of the evening. The story is told from the perspectives of three of the women, all with their own secrets to hide. Loyalties are tested, each chapter more revealing than the last. The narrative is clever and wonderfully misleading, causing the reader to second guess every move the characters make. Also, those snarky May Mothers emails that arrive daily in the women's inboxes - man I wanted to push delete so badly! Molloy does an incredible job of misdirecting her reader - I was stumped throughout and never saw the end coming. 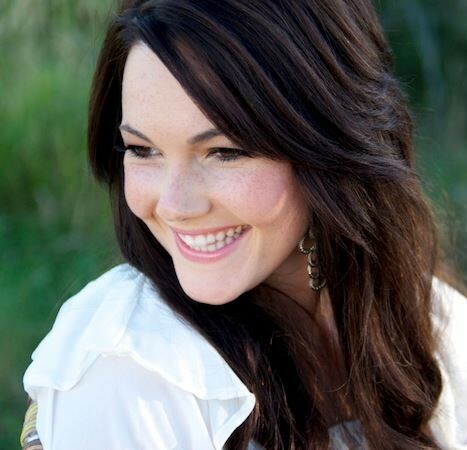 She does an amazing job of revealing the insecurities, pressure and judgement that comes along with motherhood - especially the misconceptions we believe about ourselves and other moms out there. The writing is nuanced and never overwrought - the characters are relatable and realistically flawed, each with her own issues. It's very well done. I'll definitely be checking out Aimee Molloy's next book. Lauren Weisberger is back with yet another Devil Wears Prada novel and it’s a catty, hysterical page turner. 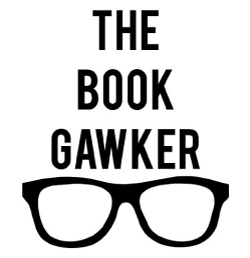 It’s likely that if this book is on your radar, you’ve either read Lauren Weisberger’s other books or are at least familiar with the film version of TDWP. This stays true to her style and is full of snappy one liners, over the top characters and my favorite – sarcasm. Emily Charlton, former first assistant to Miranda Priestly (as if you could forget the devil herself), has made a name for herself as a sought after image consultant. She’s married, living in LA and making a living keeping Hollywood’s starlets out of hot water. She’s at the top of her game until a younger, hipper version of herself begins poaching her clients. Where better to gather her thoughts and nurse her wounded ego than at her friend, Miriam’s, house in the suburbs of Connecticut? Miriam thought moving to the suburbs would be a great way to raise her young family in a safe, family friendly environment. The only problem? She has nothing in common with the uber-wealthy, plastic surgery savvy, lululemon clad housewives of Greenwich, Connecticut. After having left her high profile job in the city, she’s about one goldfish cracker away from actually going crackers. Enter Karolina Hartwell – former supermodel turned Senator’s wife (how very Kennedy-esque) who finds herself in jail for a night after being pulled over for a DUI. Who could need Emily’s image consultant prowess and Miriam’s legal aid more than Karolina, whose life is now turned upside down after such a public arrest? 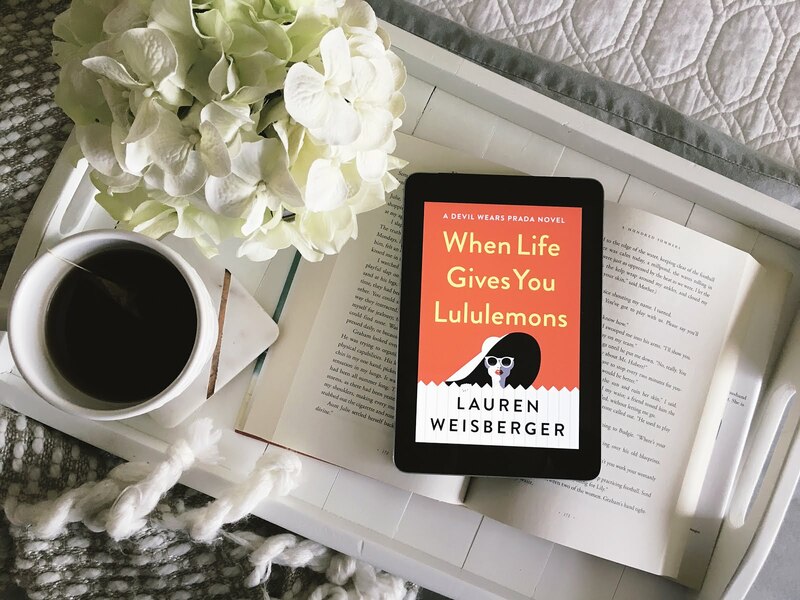 When Life Gives You Lululemons is full of the snark and sass that we would expect from Weisberger’s cattiest characters. It’s a quick, laugh out loud read with a few cringe worthy moments thrown in for good measure. Pick this one up for your book club/cocktail night with the girls, your next trip or just for a fun weekend read. It’s plenty of fun and perfectly suited for readers who prefer lighter fare in their reading. I would expect nothing less from this author and look forward to her future novels. A Review EGalley was provided by the publisher and netgalley for honest review. All thoughts are my own.